Puerto Paseo has been going through its paces today (and tomorrow as well) at the Crawley show. 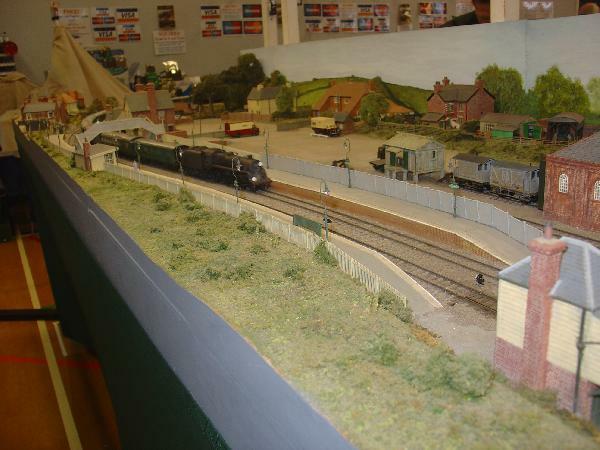 Some very nice layouts in all scales and excellent trade stands. Must make a shopping list for Squires tonight! Will post pictures after the weekend, when I'll have taken some more. 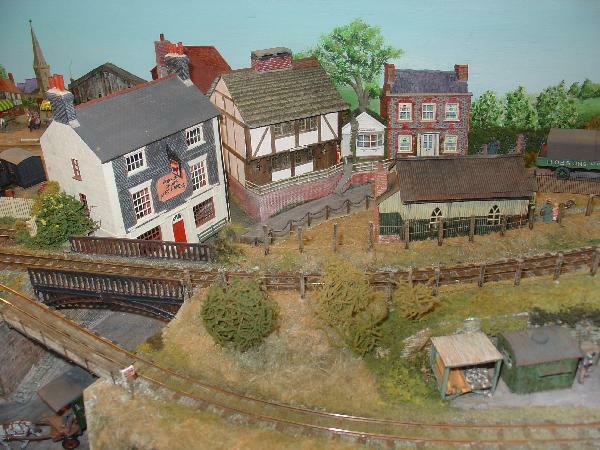 Gordon & Maggie Gravett were showing Arun Quay in 7mm scale. 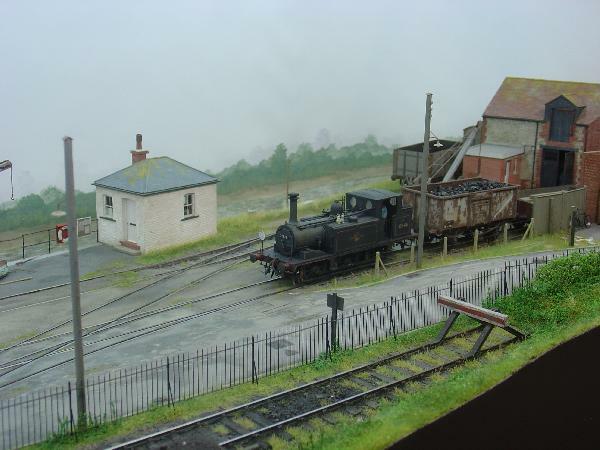 A wet, misty day perhaps in early spring, and another Terrier dong a spot of shunting. The track plan is something of a shunting puzzle. I'll add some more tomorrow, if I have time. 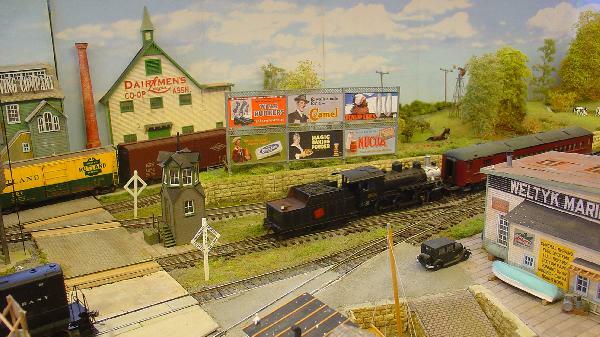 Here are some more show pictures, showing two of the American layouts. 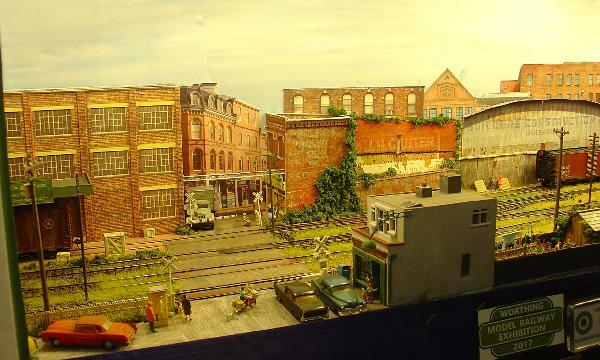 The first is Eastwood, VT, by Andrew Knights, which features a backscene made from Googled images - photo-shopped and blended to provide a run-down cityscape, and a couple of great perspective views for the street and river running into the distance. The square "thirties" shop is a re-worked Dapol kit slimmed to two-thirds of its width, and with the window frames adapted to a more American appearance (and mounted from the inside of the kit as this gives a finer appearance). 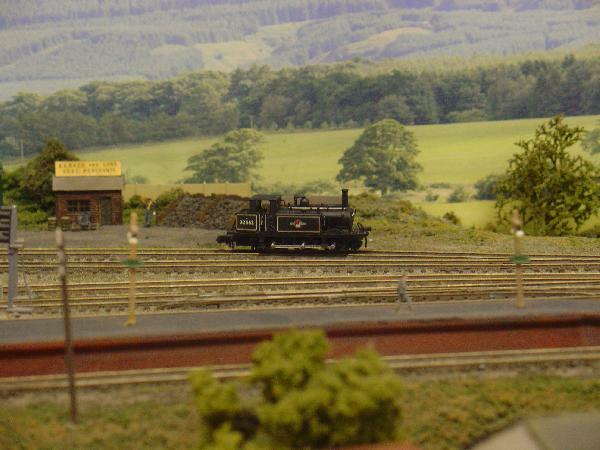 Next is a view of the other end of the layout, also featuring Dapol kits - a couple of girder bridges and a signal box - the latter much slimmed to fit between the tracks and to make the roof overhang the walls in US-style. 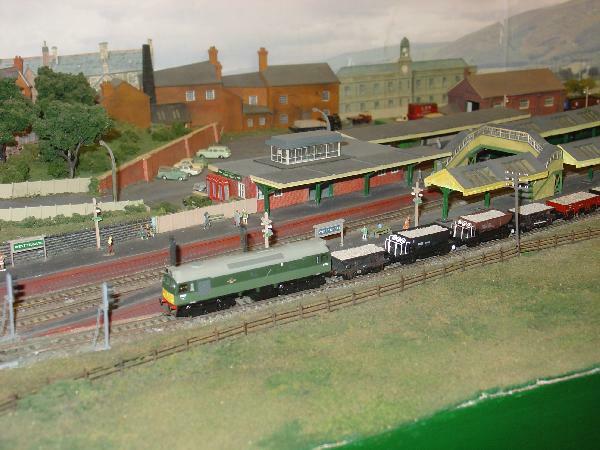 Finally in the centre of the layout was a Dapol Garage, divided into two parts and matched with other buildings. 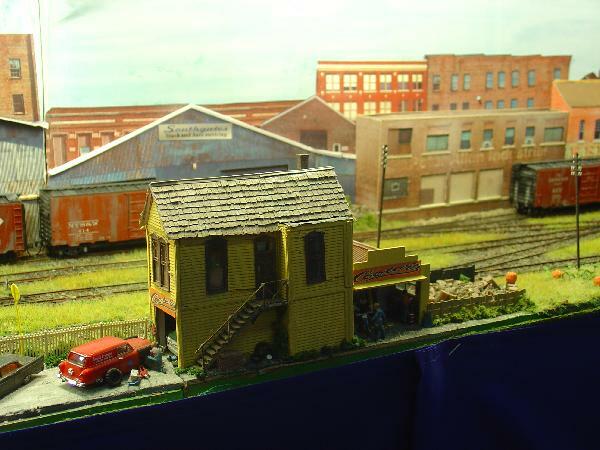 Here's one combo - the other building was a second-hand purchase and was found to be made of etched balsa. It was given new windows. The roof looks like Campbell's paper shingles, which gives it an old-style feel. Nearby in the hall was Red Wharf Bay, which has moved on a lot since I last saw it. As with Eastwood, the trains mostly featured "Maine" in their lettering. Apologies for the poor picture quality; the camera was running out of juice, which I suspect explains matters. 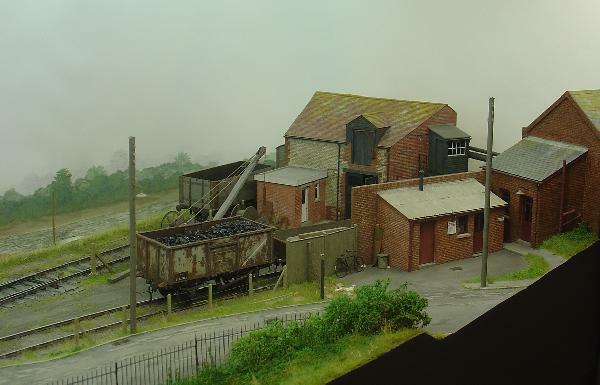 Next time I'll add some narrow gauge, including one very individual example, plus a couple more British standard gauge shots. 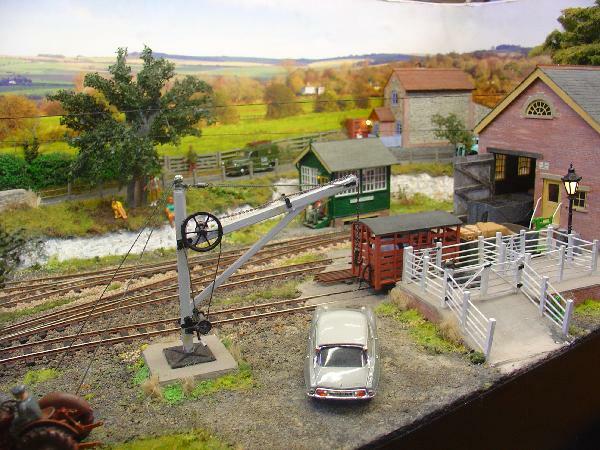 ...and a signal box - the latter much slimmed to fit between the tracks and to make the roof overhang the walls in US-style. Quite an amazing transformation, I'd never have guessed its origins. 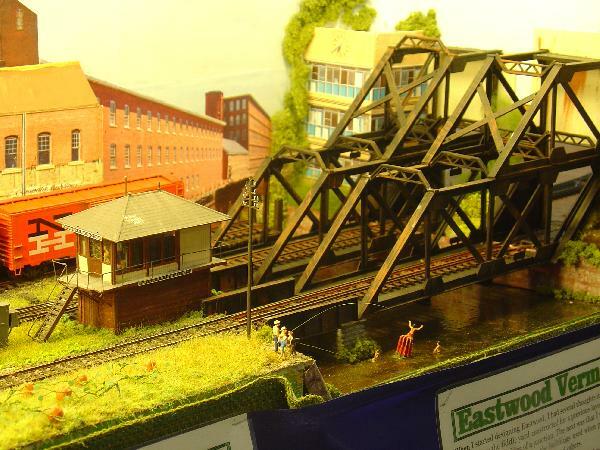 The narrow gauge exhibits included the Evalight Railway in 009. I went round before opening time, so no trains were running. I did, however, like this run of buildings on a hilly town street. What I found interesting was the Georgian two-tone brick house which was modelled in very thin low relief, with the chimneys and roof painted on the back-scene. This trick is difficult to pull off (I know, I've tried unsuccessfully) and has to be done well to work, and this one does it beautifully. In O-16.5 was the Slindon Valley Railway and its terminus at Norewood. 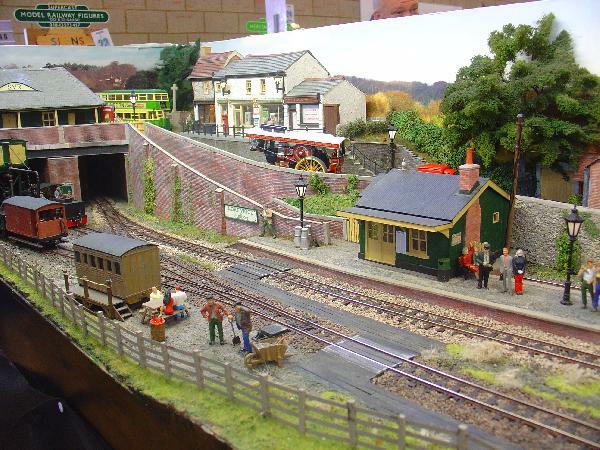 Once again, some nice examples of scratch-built structures. The last layout was unusual, to say the least. 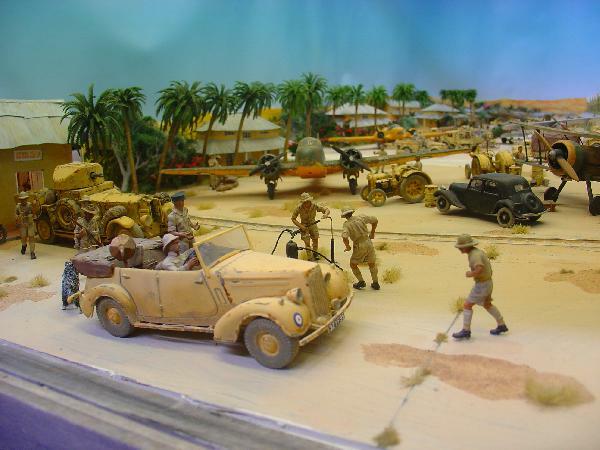 A model of a real RAF airfield in Iraq in 1941, it was a working diorama, where one looked through a loophole in some sandbags, to see a view down the runway, which was crammed with planes, road vehicles and people, all in perspective, so the nearest were 1/35 scale, the next layer 1/43 (O gauge) then successively 1/50, 1/76 (OO) and N gauge in the distance. 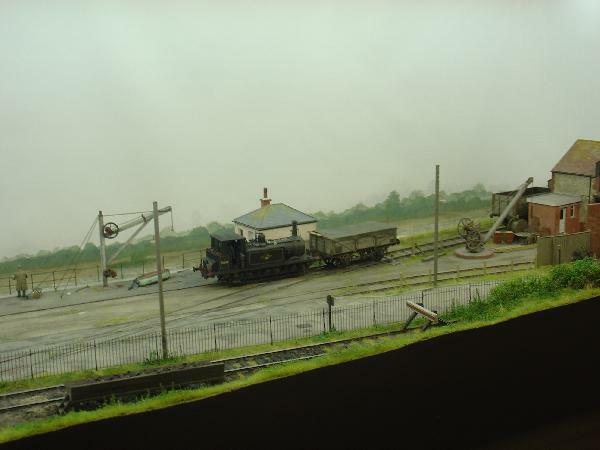 There was a moving train in the foreground, running across the scene and after a pause it appeared again in a smaller scale as if in the middle distance. 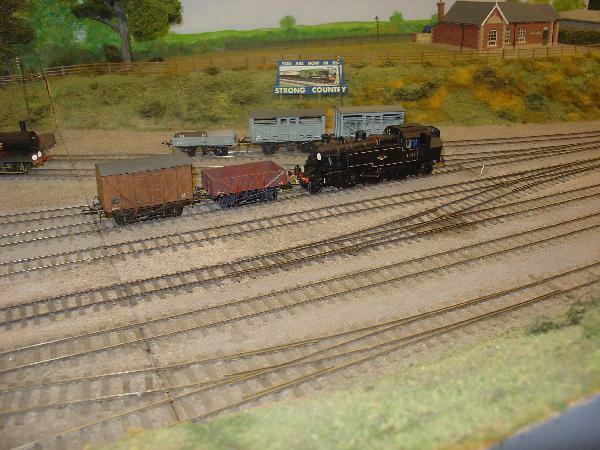 Lorries passed through in the OO scale area, and several foreground figures were mechanised. 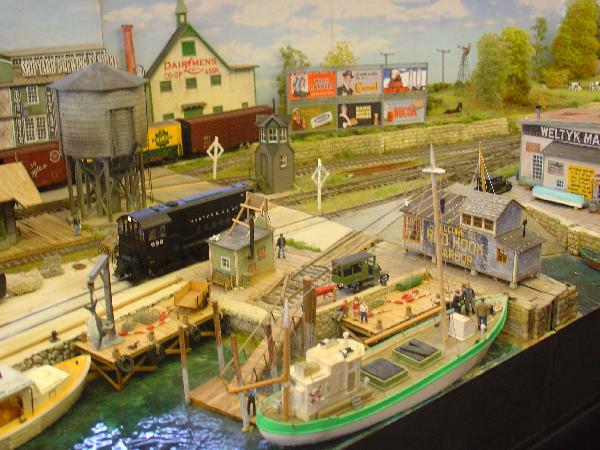 APA boxes have been used as layout baseboards for some time, and one was represented at the show. 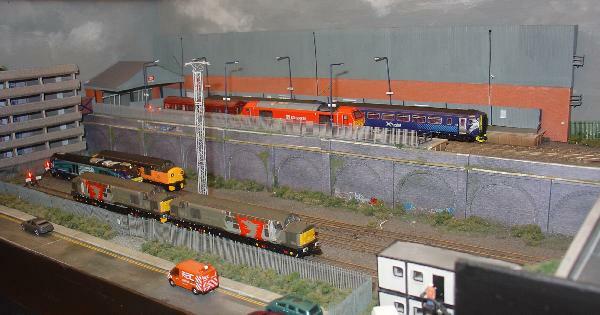 This is one end of it - representing a low level loco yard with a suburban terminus on high level arches, serving a shopping centre. 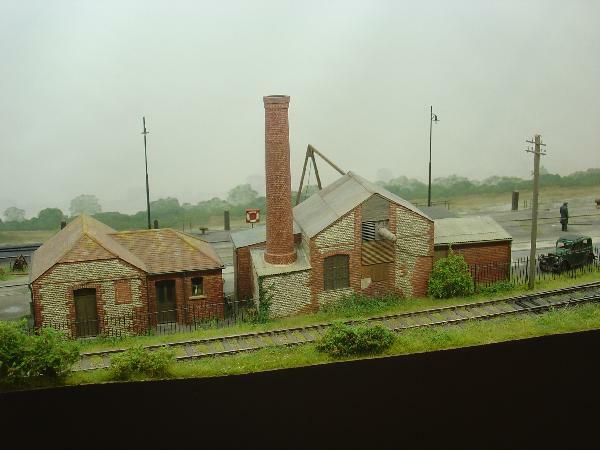 There was a central hidden section and the other end was a former branch line terminus, now used as a PW department depot. I also took a few pictures of Puerto Paseo, which I'll post in the appropriate Layout Tour thread. I followed that APA layout for a while on another forum during its construction.